Arriving at a hotel early and before your room is ready is usually a hassle but in the case of Hotel Panache, it was a welcomed treat. Ushered to a cozy corner of the lobby, a delightful selection of teas and pastries awaited us and the old-world Hollywood treatment began. Peaks of crystals, art-deco shapes and exposed light globes decorate the lobby and lead visitors up towards the feature spiral staircase. As people climbed the stairs, curiosity and intrigue set in. What seems like the whole of Paris passes us by out the window, the crowds move swiftly through the chill – trying to stay warm and catch the morning rays. As guests move in and out of the lobby, elaborate stories of actors, artists and architects fill my mind and our conversation as the setting we’re in lends itself so well to a glamourous decadence only seen in a classic 70’s Parisian film. Our bags still sat beside us but it felt like we had lived there for days. A friendly hotel staffer approaches us softly, not to disturb the fantasy currently playing through my mind of a summer romance. Our room is ready and we are directed up to the 3rd floor. Chris rides up the petite European style elevator with our well-travelled luggage as I opt to take the spiral staircase complete with monochrome carpet. Level by level I hear the hum of exotic languages from around the globe and it’s a gentle reminder that we have arrived in the melting pot of culture that is Paris. Expectations are high as we swing the door open to our Double Superior room at the end of a narrow hallway. Parisian native Dorothée Meilichzon is responsible for the Interiors and is known around the world for her eclectic style and custom furniture design. Our room is bright with floor to ceiling windows softened with linen drapery with the busy Parisian streets just three floors below. 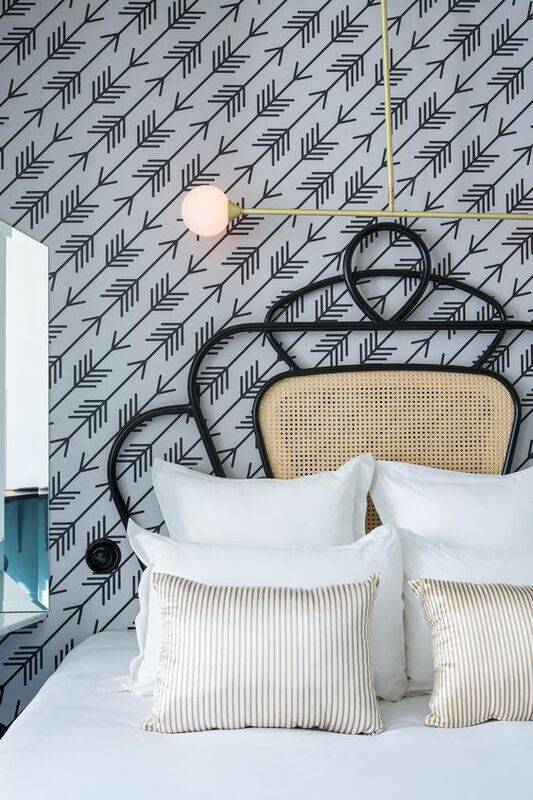 Our double bed sits perfectly centered to a feature wall covered in quirky wallpaper with a custom brass pendent light floating above the deco styled bed. As I glide through the room searching for the perfect place to house my handbag I notice the corner sitting nook complete with a set of lilac lounge chairs. The quant desk that sits alongside our bed called to Mr Smith, adorned with personalized Panache stationary, an unexpected extra will be making it’s way home with us. At the exact moment my stomach reminded me we were in the land of sweet treats and should probably eat again soon, a fortune cookie appeared. It really felt like the secret messages were written especially for us.. We won’t spoil the surprise but bravo Hotel Panache – nice touch. Located in the 9th arrondissement we were spoilt with cafes, artist boutiques and local produce markets. This area is just south of one of the best city look outs – the church and steps of Sacre-Coeur. After a quick freshen up, we set off to explore the streets and further excite our taste buds on our first day in Paris. As the late afternoon creeps upon us, we set out to retire in what feels like our private Pie de taire. The humming but muted chaos from the streets below – makes the perfect soundtrack for a holiday nap. Well-deserved and after walking the cobblestone corners for hours on end – the nap comes easily. We wake feeling rested and ready for dinner at the hotel’s restaurant. We descend the spiral staircase and enter the neighboring restaurant situated right on the corner with views leading onto the streets. This extentoinof the hotel is a space equally as quirky and inviting. A small dose of confusion sets in as we sat down in an empty dining room just before 7.30pm - who knew Parisians ate so late? The palette of dusty and midnight blues, burnt oranges and mosaic tiles make my heart flutter as we move through to the corner booth. I take this opportunity to snap a few pics of the contrasting elements that are so perfectly put together. After a toast to Paris with our chilled prosecco we turn our attention to some local cheeses and expertly cured charcuterie. The menu created by David Lahner and Paul Landre is filled with a summer delight of seasonal produce served in style and as our second course arrives the restaurant starts to fill up with food enthusiasts. Within the hour every seat is occupied and the volume is accelerated with friends and lovers alike sharing stories of love and travel. Each dish better than the last and packed with fresh flavor and adorned with finishing touches that had been picked from a nearby garden. We finish off our meal by sharing a sweet chocolate dessert, a glass of red wine and bid farewell to our waiter as we work our way past the tables of food-loving locals. We make our way back to our suite with a slight stumble up the slanted stairs, keeping the window to our Juliette balcony slightly ajar as the Paris streets below continue to buzz late into the night. We awake from our long sleep feeling rested and ready for another day of exploring. With pastries on our mind we are out the door in mere minutes and make our way down to breakfast. Waiting by the elevator, the success of a girl’s only shopping trip is uncovered as housekeeping clears the excess shopping bags from next door. Dior, Balmain, La Bon Marche, Chanel… the whole gang was there. I already feel another trip in the midst. Descending level by level and through the oversized glass doors onto the street we reflect on just how good we slept and how lovely our stay has been. Impeccable service that encourages you to make it your home and interiors that have you rethinking your whole world. Hotel Panache. Very glamour. Very quirky. Very Paris.